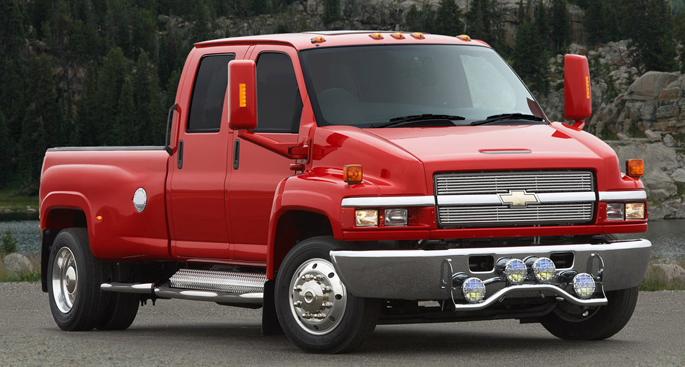 The Chevrolet Kodiak (and similar GMC Topkick and Isuzu H-Series) is a line of medium-duty trucks from General Motors. It was produced from 1980 to 2009, when General Motors exited the medium-duty truck market. The Kodiak/TopKick were commonly used as a basis for work trucks, cargo haulers, dump trucks, and similar vehicles which required powerful torque, high GVWR, and high towing capacity. There are aftermarket coachbuilders that built them as pickup trucks and commercial trucks for consumers. The Kodiak/Topkick are in the same class as the Ford F-650 and Dodge Ram 6500, as well as the International CXT in the consumer market. The Kodiak and TopKick were introduced in 1980 as stronger versions of GM's existing medium-duty C-Series trucks. "Kodiak" followed the pattern of "frontier beast" names given to heavier trucks such as the Chevrolet Bison and Chevrolet Bruin, while "Top Kick" came from military slang and tied in with GMC's heavy truck names of General and Brigadier. First-generation models can be distinguished by a full-width grille with quad square headlights arranged horizontally in chrome bezels underneath with the GMC lettering or Chevy "bowtie" above the aftermarket car grille; normal 1973-89 C50-C80s had single round headlights and the emblem all incorporated into the grille area. With the second generation in 1990, all GM medium conventionals took on the "Kodiak" or "Topkick" names, until they were dropped in 1995. These models used the GMT400 pickup cab until 2003, always with the original "square" dashboard dropped from light-duty models in 1995. While U.S. production ended in 2002, they continued to be produced for the Mexican domestic market in GM's Toluca plant through 2008. 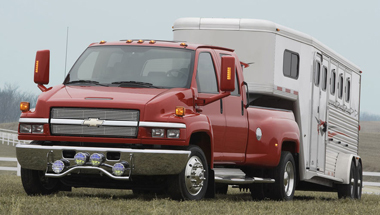 Beginning with the 2003 model year, US-market models moved to a new platform with a more spacious cab based on the GM full-size vans. The 4500 and 5500 trucks had the option for four-wheel drive. These trucks featured solid front axles, on both 4x2 and 4x4, instead of independent front suspension featured on the 3500 trucks. The drive-train consisted of a Duramax V8 engine, a Allison 1000 transmission, and a Dana S 110 rear axle. The 4x4 models added a New Process 273 C Transfer case and a Dana 70 front axle. The trucks had the Ultra Ride air suspension, which replaces the rear leaf springs with two frame-located airbags that greatly improve the empty ride of the truck and increase overall carrying capacity. A special Kodiak C4500 was introduced at the Chicago Auto Show in 2006. It is clearly aimed at the International RXT, also introduced there, with a DVD-based navigation system and powerful audio system. The two share a number of similarities, such as the options allowed in their premium packages, although the C4500 has higher power (300 hp versus 230 hp) and the RXT is a 4x2 drive vehicle with a higher towing capacity at 16,000 lb . The newest version of the United States Presidential State Car is a Cadillac-badged limousine, which is actually based on a GMC Topkick chassis. The vehicle is styled as an enlarged Cadillac DTS. The interior is cushy, especially the air-suspended driver’s seat in the air-suspended cab on the Kodiak truck. A DVD entertainment system is available (but not installed) to anesthetize back seat occupants, and there’s a lot of room for them, and XM navigation is optional (and installed). Another buyer’s choice item is side rear-view cameras. When the turn signal is used, a camera on that side shows a rearward view down that side of the truck on the nav system screen. With the big trailer mirrors this seems an expensive redundancy. 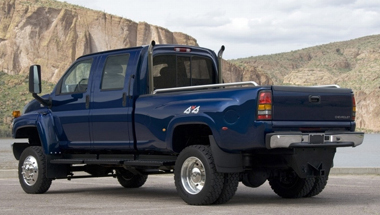 The Chevrolet Kodiak Accessories are also available for Kodiak admirers to complement the external appearance.